I need to amplify it because it provides a nice example of at least six useful and important patterns all in one post. This is why I believe Pradeep is one of the leading Indian testers. His story is all about asking for testability and all the good things that can come from that. It’s rare to see a good example present so vividly. I wanted more details, but the details he gave were enough to carry the point and fire the imagination. I have never heard of using videos for scripted testing. Why didn’t I think of that? Notice how many people Pradeep mentions in his post. Notice the conversations, the web of relationships. 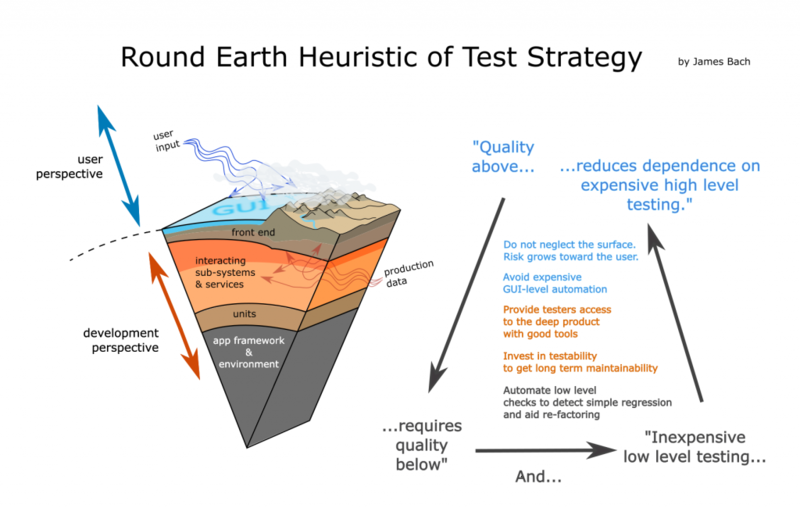 This aspect of testing is profoundly important, and it’s one that I find Pradeep to excel in. It’s kind of like x-ray vision– the ability to see past the objects of the project to the true bones of it, which is how people think of each other, communicate with, and influence each other. Pradeep’s story is a little bit technical, but it’s mostly social, as I read it. Pradeep’s post is an example of an experience report. Not many of them around. It’s like sighting a rare orchid. He published it with the support of his client, otherwise we’d never have seen it. That’s why there can never be an accurate or profound history written about the craft of testing: almost everything is kept secret. The same dynamic helps preserve bad practice in testing, because that bad practice thrives in the darkness just as roaches do. There’s not a lot of good leadership in Indian testing. Someday there will be. It’s beginning to happen. Pradeep’s post is an example of what that looks like. There must be more than a hundred thousand testers in India. (I wonder if some agency keeps statistics on that?) I would expect to see at least a hundred great tester blogs from India, not six! I’m on a new project lately, working with a team at QualiTest. We’re testing a class III medical device. This is an exciting project, because for the first time I am aware of, formalized exploratory testing will be used to do such a validation. We will not rely on masses of procedural test scripts. I’ve been called in on this project because I created the first published formalized ET process in 1999 (for Microsoft), and created, with my brother Jon, session-based test management, which is basically a general form of that Microsoft process. The QualiTest team consists of senior testers hand-picked for this job, who have regulatory testing backgrounds and an enthusiasm to use their brains while they test. On top of testing well, we have to document our testing well, and trace our testing to requirements. Automatic logging is one of the tools that will help us do that. I am amazed at how crazy nuts some people get over documentation– how they sweat and shiver if they don’t have a script to cling to– and yet they don’t spare a thought for logging. Logging is great for testers, programmers, and technical support. Logging is automatic documentation. Sing the praises of logging. I’m talking about function-level logging built into the products we test. Instead of following a script written weeks or months ago by some over-literal, function-besotted and data-blind intern, the tester can think, explore, play, and maintain the thread of inquiry without worrying that you won’t know what you tested, later on. Instead of remembering what you tested, the product tells you how you tested it. Process the log with a simple Perl script, and you can potentially have an automatically generated test report. Instead of just wondering how you made that crazy bug happen, the developer can consult the log. Instead of asking the customer what he was doing moments before the crash, he asks for the log. If logging is built into the base classes of the product, very little coding is involved. This idea first occurred to me in 1993, after hearing from John Musa about how his telecom systems would “phone home” with data about how they were being used, but I couldn’t get a programmer to put logging into anything I tested until I was at SmartPatents in 1997. Since then I’ve helped several projects, including a couple of medical device projects, get going with it. 1. Each significant action that the user takes shall be logged. (pressing buttons, touching screen objects, turning knobs, startup and shutdown, etc.) This provides critical information needed to demonstrate test coverage during validation, and improves our ability to meet and exceed regulatory requirements. 2. The results of any diagnostic self-tests or assert failures shall be logged. 3. Any function should be logged, regardless of user action, that causes a change to data, screen display, system configuration, modes or settings, communicates with other equipment, or produces an error or information message. 4. Everything that could be interesting and useful for testing, support, and system debugging should be logged UNLESS the event occurs so frequently (many times a second) that it poses a performance or reliability risk. – Time stamp: For instantaneous events, time stamp (millisecond resolution). For events over time log the start and stop times by logging it as two separate events (e.g. “Event START”, “Event END”). Events that set a persistent mode or state can be logged as one event (“high security mode ON”) but the state of any such modes shall be automatically logged at startup and shutdown so that a complete record of that setting can be maintained over time. – Event type ID: always unique to event type; IDs not re-used if an event is retired and a new event is created. – Event information: any data associated with the event that may be useful for customer service or assessing test coverage, this data may be formatted in ways specific to that event type. 6. At startup and shutdown, the current settings, modes, and confuguration shall be recorded to the log. 7. Any errors shall be recorded to the log, including the actual text of the error message. 8. Every type of loggable event shall be stored in one table in the source code or in a data structure accessible on the system itself, such as a header file, enum, array or resource file. This facilitates providing the validation and customer service teams with a complete list of all possible events. 9. The log format shall be in text form, structured and delimited consistently such that it can be parsed automatically by a third party tool. The data for each event should be on one line, or else be marked with standard start and end markers. 10. The log format should be structured and delimited such that it is reasonably human readable (such as tab delimited). 11. The level of detail included in the log file should be configurable in terms of preset levels: 1- error and service events only, 2- Functional events, error events, service events, 3- All events including diagnostic information messages about internal states and parameters. 12. The log should behave as a ring buffer with a maximum of X events (where X is configurable within some limit that would not be exceeded in 7 days of heaviest anticipated use). If the size of the log exceeds available space, the oldest events shall be discarded first. 13. When the log is exported, it should have a header that identifies the software version (and serial number of the HW, if applicable) and current configuration.